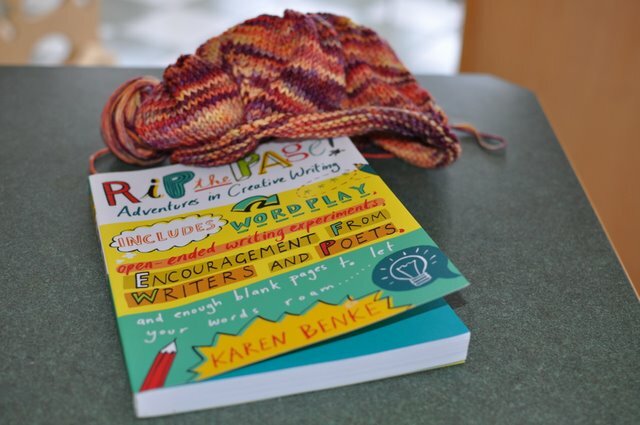 Two of my favorite things are knitting and reading, and the evidence of this often shows up in my photographs. I love seeing what other people are knitting and reading as well. So, what are you knitting or crocheting right now? What are you reading? " I am joining in with Ginny of Small Things today. I am re-knitting a new sweater for Hadley. I have already knit this once… but I had been trying to resize a smaller pattern. I knit it all only to find the neck hole was too small. Now I am trying again, and I fear the neck will be too big… I should just pay the 6$ to look at the bigger pattern, but that would be too easy, right? I am also enjoying all of the great ideas in this book. Drew is a whiz at math, I have him in 4th grade stuff… but writing and reading are not so inspiring to him. I think a few of these ideas he will love… I am looking forward to doing a bit with this book in the next few months. I am reading Evidence of Things Unseen by Marianne Wiggins. It is a novel and a National Book Award finalist. It took me a little while to get into it (the writing almost too good for me!) but now i like it a lot. I think my next project will be knitting “wristies”, which are those half gloves that cover the lower half of your hand but leave your fingers free. Also, I ordered a very nice pillow needlepoint kit from a company in N.Y.C. I haven’t done needlepoint in years so i hope I will remember how to! The yarn is so pretty! I’ve done that before with sweaters. I made one for myself a few years ago bound off & everything. The neck won’t even fit over my 2 year olds head. It’s sitting in the closet. I haven’t looked at it since. So depressing! Good for you starting over again! Popping over from Ginny’s. I love that yarn! That book looks so interesting, I can’t wait to check it out.